2018 Q1: Another Up Year? There’s a lot of talk about the real estate market today. Here’s what I’m seeing from the first quarter of 2018 along with predictions for the rest of 2018…. Always hand-written with stats direct from our local MLS. The Above image is a visual summary of my statistics reference from our local San Diego Association of Realtors. Although sales volume was down 8% over Q1 last year, inventory had declined 5% over last year, too. In light of a similar drop in inventory, after 5 straight years of dropping inventory & rising prices, it is no surprise to see a small drop in sales. However, January & February felt and were unusually ‘slow’. The market took off much later than normal more towards the end of Q1. Why? Keep reading…. 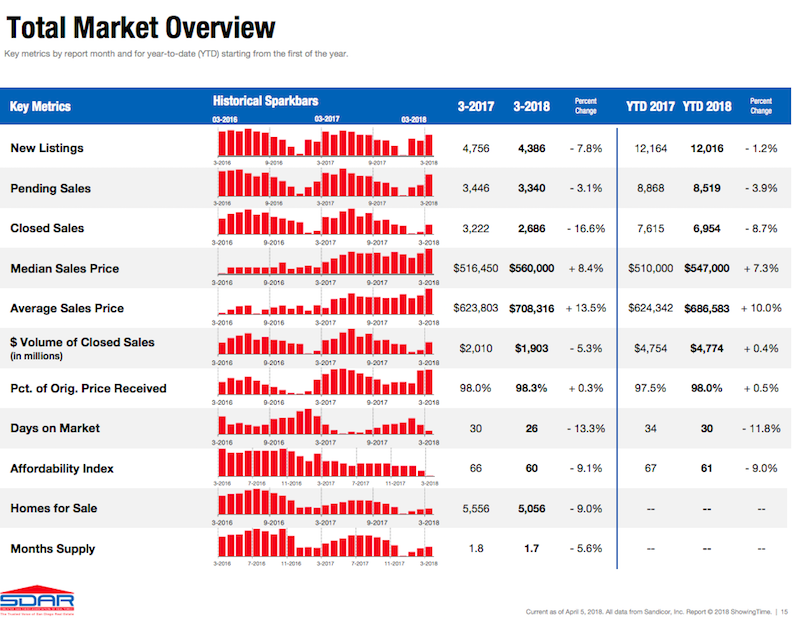 New Listings are down 7.8% over Q1 2017. Inventory of detached homes is down 10.4% (condos down 5.2%) with rolling 12-month average down 18.4. After seeing 20% drops in inventory in 2017, I’m happy to see the inventory drop trending back towards normal. We’ve seen a drop in inventory of about 20% year over year for 3 years now. The downward trend is clear for 5-6 years straight. The seasonal norm is that inventory is the lowest at the very beginning of the year and starts picking up all throughout the first 2 quarters. If you read or listen to the news, you already know we have a housing shortage. This continues to fueling price increases. While we are dipping below the rolling 12-month average in Q1, inventory is still dropping, thus putting more upward pressure on prices in the near-term. Rates started the year around 4.05% (MND average), and then steadily climbed the first 2 months in Q1 before hitting a high of 4.56% But then rates relaxed and slid a tad down to 4.5% before closing the quarter. 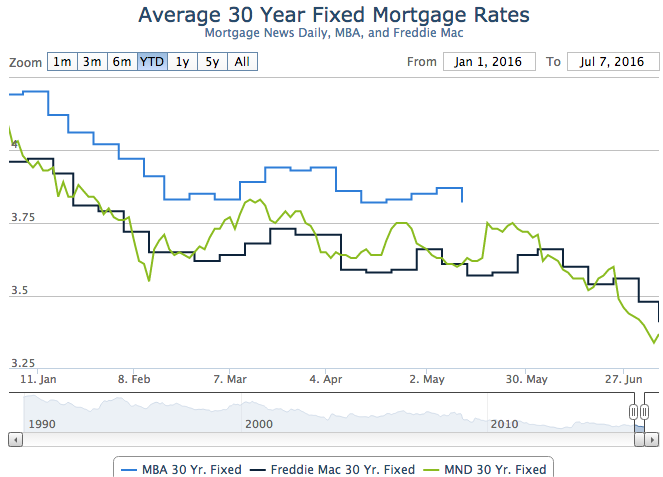 Perhaps this quick rise in rates could be attributed to the slow start to Q1? 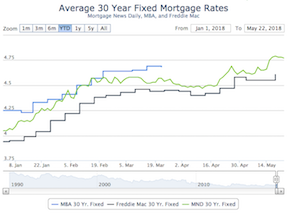 Most lenders I’m speaking with are expecting rates to stay higher all year. The fed raised the Federal Funds Rate 3 times in 2017. The new fed chair Jerome Powell appears to be following step when they raised the rate .25% in mid-March and also signaled 2 more hikes this year. Clearly the Fed believes our economy has stabilized and is trying to ward off inflation. We’ve been well below the 2% inflation mark for some time now. Continued federal fund rate hikes will raise the cost of Adjustable Rate Mortgages (ARM’s) often used on 2nd mortgages and Equity Lines. 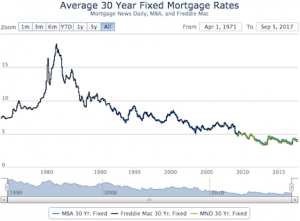 I advise anyone sitting in an ARM to look into a fixed mortgage ASAP, unless you intend to sell in the next 2 years. Tax reform is another big change just pushed through congress. It’s possible that the early Q1 slowdown had something to do with people scrambling to check with their accountants to see how the new tax plan would effect them (I know I was!) and holding off on a purchase. In San Diego, various pockets/price-points were effected more than others. The low-end price points of $300k have minimized tax advantage due to the raised minimum deduction. However, that market is strong with investor demand and the growing droves of people seeking affordable housing where there is none. The $3-600k price point enjoys the biggest advantage of writing off all mortgage interest and almost all the property taxes, too. The $6-1mil range will start to see a cap on property tax write-offs (this depends on how big the buyer’s home loan is as well as their income). The mortgage interest deduction cap being lowered to $750k will effect those with high-balance loans closer to $1mil . Lastly, the $1-1.5 class is likely hit the hardest due to both the $750k cap in loan interest write-off as well as a much lower write-off for property taxes, if any (most people in this price range will hit the $10k SALT cap just on their income). I do believe that while these tax changes may hurt some people in one area of the economy, there are also big advantages, especially to those using the corporate tax cut as small business owners, that will continue to supply buyers in this price range. In short, I think we will see a shift of supply lines without a major change in the amount of supply. Once you get over $1.5mil, I think the market levels back out to how it was because there used to be a $1mil cap on mortgage interest deduction and the drop in property tax deduction is not significant to people who can afford homes in this price range. Price is a balance between supply and demand. Total activity/sales went down a bit, but Supply has also gone down. Thus, we have seen a pretty consistent rise in home values all quarter with a rolling 12-month average of about 8%. We also hit another record high for median sale price of detached homes in March at $635k. Seasonally, market prices usually peak near the end of the 2nd quarter, but with such a slow start to the year, I’m wondering how this year will look? We’ve oddly had our highest median values in either October or November the last few years as the market seems to do one more push before the holidays. While it’s not that hard to predict the short-term if you have the correct statistics at hand, mid & long-term economic trends are quite elusive and usually prove me wrong. That said…. It is my belief that the market is slowing down. We’re still going up in prices, but the trending numbers I’m reading are indicating a slow down. And there are market segments and areas that are also going to slowdown first – typically the neighborhoods furthest from the coast and downtown will show the signs first. That said, I’m not expecting prices to drop or a “bubble”. We are insulated by a relatively good economy and record low inventory – the housing shortage is not expected to end any time soon. Also, lenders have been giving real people, real loans, so defaults are much less likely than they were in the past. I’m still projecting a 3-4% gain this spring in home values, but 100% inline with my prediction from last year, I predict that inventory levels will start to stabilize by the end of the year as will home prices. Perhaps we will see 4-6% total gains this year in home values. I don’t know what to expect for home loan rates this year, but we’ve already seen another .25% rise in Q2 as I’m writing this to put us at 4.75. I’m going to guess that we will end the year around 5%. If you got this far and read my entire article, please let me know what you think with an email. You’ve got a free lunch coming to you! And thank you for your referrals – they are the foundation of my business at over 90% the last 5 years. ps. feel free to check out my San Diego Green Homes site if you have a passion for living green/sustainably and contact me (cell: 858-761-1707) for a free consult regarding how to green your home.